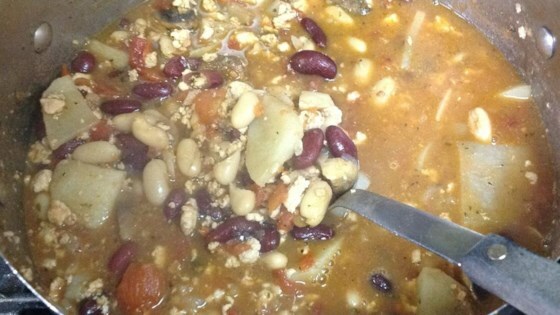 "This is a wonderful dish for cold winter days that really fills you up! My mother used to make this for my family, and it quickly became a favorite. This isn't your normal 'hot' chili and it's a great change of pace. It's best when served with buttered saltine crackers. This chili also freezes well." Heat the oil in a soup pot set over medium heat. Add the ground beef, garlic, and onion. Cook, stirring to crumble the ground beef, until beef is no longer pink. Drain off any excess grease. Season with salt, pepper, nutmeg, beef bouillon, and chili powder. Add the sugar, tomatoes, light and dark kidney beans and potatoes. Cover and simmer over medium-low heat for 1 hour, stirring occasionally. Not when you're in the mood for Chili. This was very good. But, don't expect it to taste like regular chili. We ate it with sour cream and cheddar and I only wished that I had made more. The kids and hubby loved it. We accidentally bought 1 pound of beef chuck... but not ground. We cut it up into small chunks and it was really good. I liked the texture it added. Wonderful! tastes great with about a half or full cup of Jameson Irish Whiskey in it as well.